﻿﻿﻿﻿﻿﻿﻿﻿﻿﻿When the weather is fine I like to cook and eat outdoors as often as possible. To me a BBQ doesn’t mean burnt bangers and some charred chops. Modern BBQs are gourmet kitchens that actually allow you to do much more than your regular indoor unit; smoking, rotisserie, flame grilling. I remember growing up in Australia it was common for folk to roast the turkey in the Weber at Christmas. In the first of my BBQ series I’m going to head to the U.S and a righteous rib recipe adapted from the Kansas City Barbeque Society (whose motto is : “BBQ – it’s not just for breakfast.”). I have adapted it for 2 reasons; firstly it contains ingredients that I feel are either a little dubious or unavailable to me, such as liquid smoke and poultry seasoning. Secondly, the salt content was so incredibly high, I had to reduce it. My recipe is high enough and definitely not the kind of thing I would recommend eating on a regular basis. I can’t even imagine eating the original version with well over twice the salt AND the poultry seasoning. I have used this rub and sauce combination on pork and beef ribs and also on chicken and it’s totally scrumptious on all - in a bad way, it’s so bad and so good. With this kind of addictively delicious food on the menu I can see why obesity is on the rise stateside. You may need an exit strategy! Mix all ingredients together and store in a jar, it will keep for several months. Combine all the ingredients in a saucepan and bring to a simmer over a medium heat and cook until all the sugar dissolves, stirring for about 5 minutes. I separate the mix into 2 parts at this point and keep half the ‘starter brew’ in a jar for another time and then only add half (2 cups of the ketchup), it just depends how much of the sauce you want, this mix will make 5 cups in total. Add the ketchup and stir well, be careful at this point as the ketchup has a tendency to spit and splatter. Reduce the heat to low and leave the sauce to simmer gently uncovered for 30 minutes. 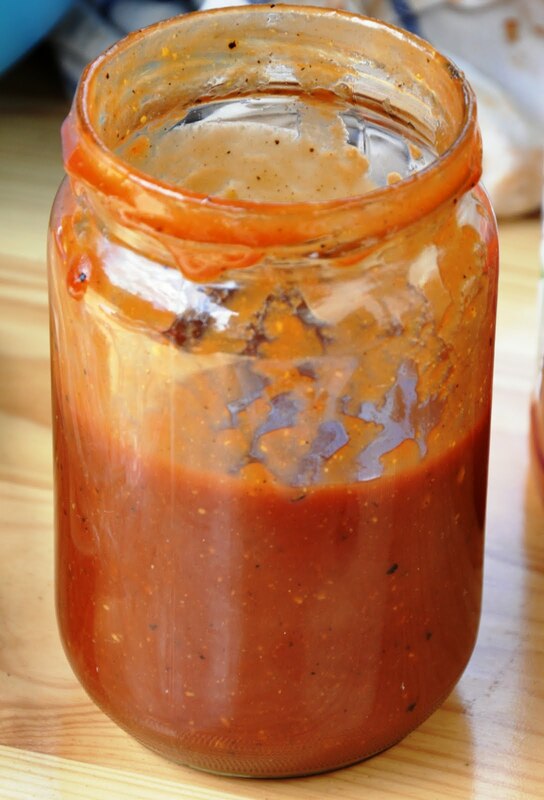 You can use it right away or bottle it; the sauce will keep in the refrigerator for several months. Buy 1 rack of baby back ribs for each person and have the papery skin removed (easy to do yourself if you don’t have a butcher). You will also need some BBQ smoking chips if you can get them. 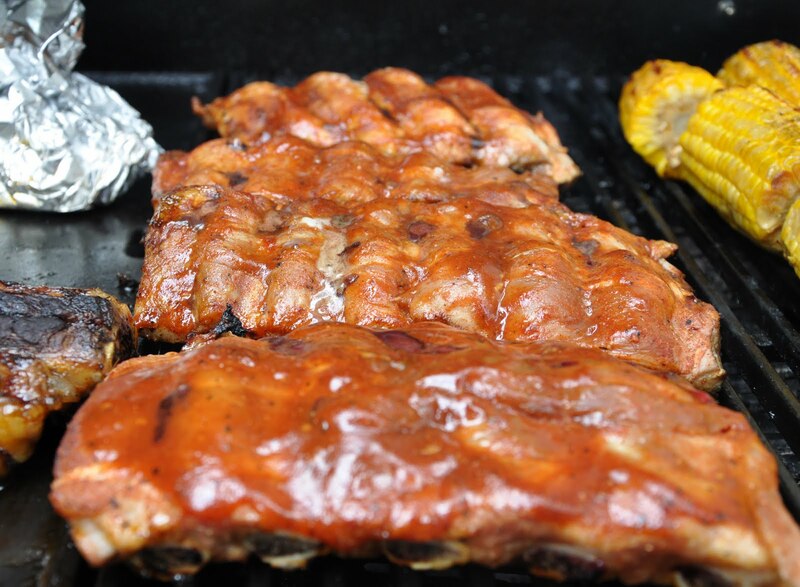 Sprinkle each rack with the rub (about a tablespoon each); pat the rub in with your fingers, cover and leave to marinate in the fridge for an hour. Soak 1 cup of smoking chips in apple cider (or water) for 1 hour, then drain and put in the smoking box of your BBQ grill. Don’t start grilling until you see smoke. If you don’t have smoking chips or a smoking box, don’t worry your ribs will still be good, you’ll just miss out on the extra smoky hit. 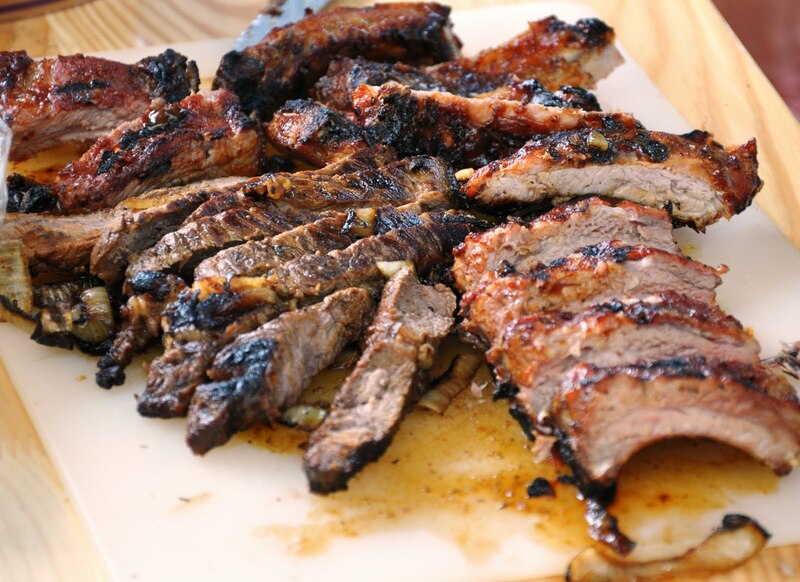 Put your ribs on the grill away from the flame and indirect grill for 1 hour (this means on a 3 burner BBQ you light the left and right, and put the ribs in the centre, on a 2 burner light 1 side and out the food on the other). Brush the ribs with the sauce now and continue to indirect grill until they are done, this could take another 15 -30 minutes. When they are done the meat will be extremely tender and will have pulled back from the bones. 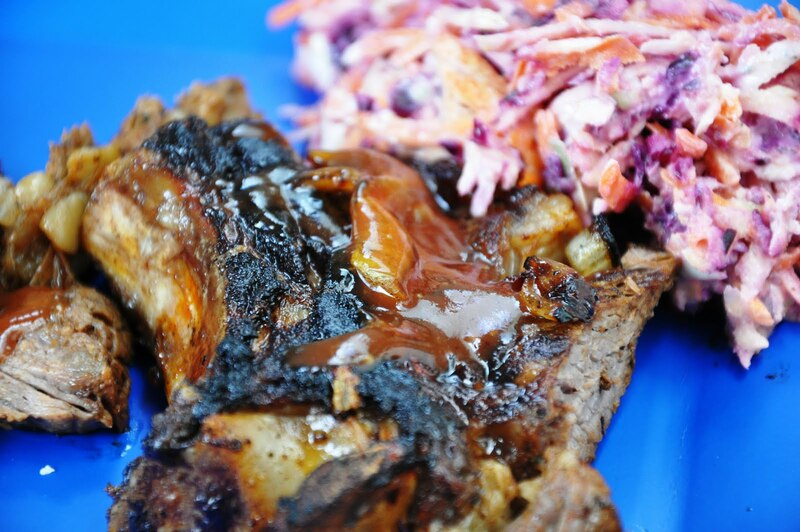 Transfer the ribs on to a platter and serve with extra sauce for guests to add themselves, BBQ corn on the cob, a large bowl of coleslaw and cold beer. Roast Chicken and Sweet Potato Pie. Chicken, Artichoke and Green Olive Tagine, with Saffron and Pistachio Couscous. Slow Cooked Lamb with Aubergine. All photography and text copyright of Sara Flanagan . Ethereal theme. Theme images by carlosalvarez. Powered by Blogger.